A new 2,000 tonne railway bridge has been completed and slid into place over the M8 as part of a £500m project to upgrade Scotland's motorway network. Transport Scotland, which commissioned the work, has released a time-lapse video of the bridge being manoeuvred. It will carry the Rutherglen and Whifflet line over the new M8, which is under construction to the south of the existing A8 in North Lanarkshire. Work to upgrade the M8, M73 and M74 is due to be completed in spring 2017. Graeme Reid, of Transport Scotland, said: "The success of the bridge slide marks a significant milestone as part of the M8 M73 M74 motorway improvements project and is the first tangible improvement to the transport infrastructure. 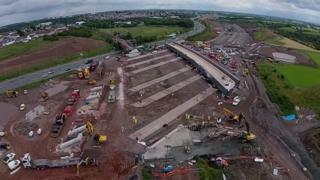 "The time lapse gives a real sense of the challenges involved in delivering a project of this scale and encourages a greater understanding of civil engineering schemes and the benefits they can bring." Scottish Roads Partnership, the consortium responsible for designing, building, financing and operation the motorway upgrades, took possession of the rail line on 11 July. The line was returned to Network Rail on 26 July, with rail services resuming the following day. The motorway improvements project began in February 2014 and is scheduled for completion in spring 2017. The work will see upgrading of the M8 between Baillieston and Newhouse to motorway standard. This will require upgrades to the connections to the M73 motorway at Baillieston and a new junction at Shawhead, which will connect to the A725 East Kilbride road. There will also be new junctions at Eurocentral and Chapelhall. Improvements to the Raith Interchange near Hamilton in Lanarkshire include realignment of the A725. There will be an underpass for the A725 and bridges carrying the Raith roundabout. The improvements are expected to cut journey times by up to 18 minutes for the busiest sections of the M8.